The Detector is a device which comes into action at an attempt to open the lock by means of Lock Picks or the use of false Keys. The accidental use of a wrong key may produce the same effect. When the owner tries to open the Lock with its own Key he finds it set fast and cannot unlock until he has regulated it.The illustration shows the detector in action. The over-lifting of one of the levers, by some instrument other than the right key, has raised the bottom lever beyond its proper position, causing it to be caught up by the Detector Spring and the bolt cannot be withdrawn. As the true Key when next used will not unlock, the owner immediately learns of a wrongful attempt to open the Lock. By a sharp turn of his Key, in the reverse way as if trying to lock a second time, the owner can regulate the levers and then the Key will unlock in the usual manner. At the operation of regulating, the Bolt moves forward a short distance, which is possible only when the Levers are correctly lifted by the proper Key and the bevel on the Bolt raises the Detector Spring, thus allowing the bottom Lever to fall to its normal position. 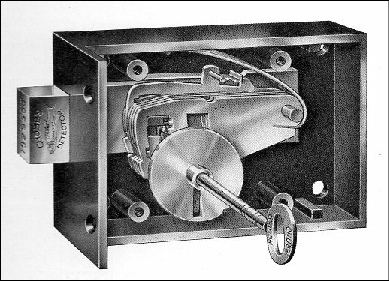 The above details are taken from Chubb’s 1930 Lock Catalogue and refer to the Detector Mechanism as described in Patent No. 11,523 dated 11th January 1847. This was the fourth development on the original design patented in 1818. However, the lock shown above includes the barrel and curtain which was introduced following A. C. Hobbs’ successful manipulation attempt in 1851 and individual lever springs replace the ‘comb’ springs detailed in the patent.